Smith River conservation history in the making! The Smith River National Recreation Area was created in 1990 by the 101st Congress to protect and enhance the special scenic values, natural diversity, cultural and historical attributes, wilderness, wildlife, fisheries, and recreation opportunities of the area. Now, twenty-two years later, the Smith River Alliance and partners have just completed Phase I of the Hurdygurdy Project — transferring 1,164 acres in the Hurdygurdy Creek watershed to the Forest Service for inclusion in the National Recreation Area. The Hurdygurdy Creek Project includes watershed lands and frontage along Hurdygurdy Creek, Little Jones Creek, and the Siskiyou Fork of the Smith River and is located in the very heart of the watershed. The property includes significant spawning and rearing tributary for coho, Chinook salmon, and steelhead. It is the last major land purchase needed to complete the 460+ square-mile National Recreation Area. Special thanks to Senator Dianne Feinstein, Congressman Mike Thompson, and dozens of our nation’s leading fishery restoration and conservation organizations for their assistance with this project. Together we have accomplished an important step in completing the Smith River National Recreation Area. 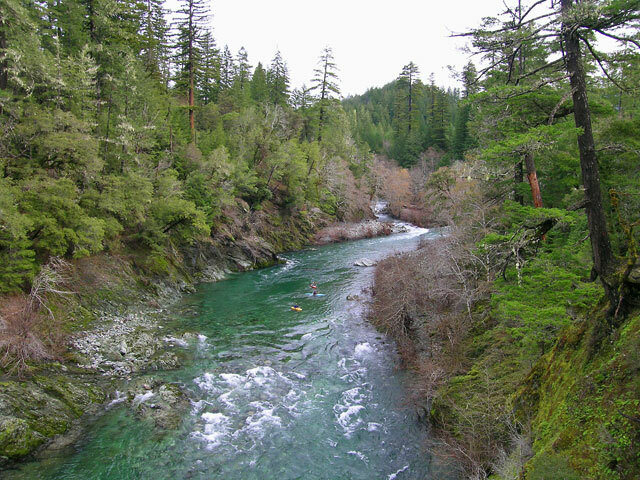 The Smith River is one of the “crown jewels” of the National Wild and Scenic River System (over 300 miles included) and is the last major undammed river in California. It is widely recognized as one of the premier “Salmon Strongholds” in the lower 48 states. Over the last several years, SRA and its partners have waged a local, statewide, and national campaign to add these vitally important watershed lands to the National Recreation Area. The California Department of Fish and Game (DFG) and SRA are partners in a strategic, long-term population assessment and monitoring program for coho salmon in the Smith River. Salmonid redds are the “metric” used by DFG to define the status and trends of adult salmonids in coastal California streams. Last winter SRA crews and the Mill Creek Fisheries Monitoring Program recorded 3261 salmon and steelhead redds from a sample of 41 survey reaches throughout the Smith River basin. The entire Mill Creek sub basin was surveyed and 1612 individual salmonid redds were recorded in 18 reaches. All coho salmon observations were made in Mill Creek with the exception of one lone male observed in Rowdy Creek. It is important to note that Mill Creek provides exceptional low gradient spawning habitat for coho salmon and remains the most important sub-basin for this species. SRA crews are currently conducting snorkel surveys for juvenile coho salmon in reaches throughout the Smith River to define basin-wide spatial distribution and habitat needs for this important life stage. Nineteen reaches have been surveyed to date, with nine reaches containing juvenile coho salmon. Notably, crews are finding numerous locations along the main stem Smith River supporting juvenile coho salmon. We are grateful to the DFG’s Fisheries Restoration Grant Program for making this project possible — and we’ll continue to share insights and findings from the field team in future newsletters. Humboldt State University Hydrology and Watershed Management 310 Class — For the second consecutive year, Professor Andy Stubblefield returned to the Smith with his Watershed 310 class. The class toured restoration projects in the Mill Creek watershed and ended the day at Rock Creek Ranch. On Sunday, the Humboldt-based Summer Leadership, Education, Adventure Program (LEAP) provided guides, rafts and equipment for a float trip on the South Fork Smith River. Del Norte County Unified School District High School — Students toured the on-site sustainable power station including the micro-hydro and solar systems and heard a briefing on the projects from local engineer Aaron Valley and Caretaker Darell Warnock. The micro-hydro and solar systems generate over ninety percent of the power required by Ranch facilities. The students also worked in the garden on a number of projects. Inner Freedom Yoga Retreat — The group came as part of their Yoga Immersion Training and spent the weekend deepening their connection to yoga on and off the mat. Even with the gentle rain, it was amazing. Immersion Camp – This year, Immersion Camp was a partnership with Rural Human Services, the Wild Rivers Community Foundation and the Building Healthy Communities Initiative. 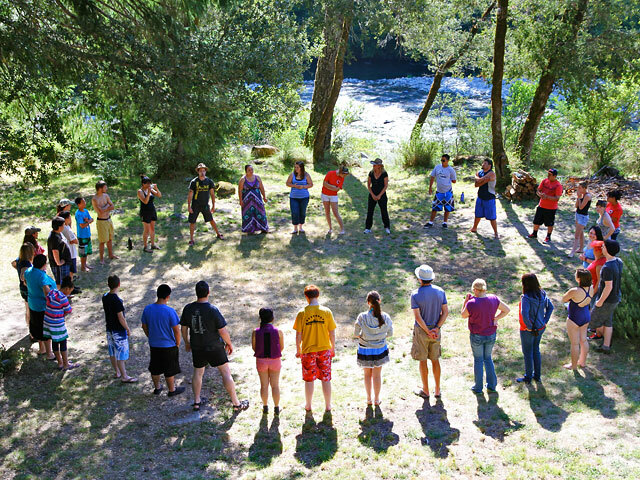 Over sixty youth came to Rock Creek Ranch to learn about what makes the Smith River so great! They donned snorkels, masks and fins to view salmon in their underwater habitat. The local newspaper also came to Rock Creek Ranch to report on the story. Big Green Bus – Eleven Dartmouth students visited the Ranch as part of their travels across the nation to inspire grass roots action on environmental issues and to encourage sustainability at the community level. The students will travel 12,000 miles across 24 states in a re-used veggie-powered Greyhound bus. Over the last few years SRA has been working with 14 different public agencies, local tribes and others to design and develop an Interagency Visitor Center (IAVC), which would be strategically located along Hwy 101 in the Crescent City Harbor area. Recent accomplishments include planning and conceptual design by a Design Committee (see conceptual design) which has led to a grant from the Wildlife Conservation Board to prepare construction plans and to complete environmental compliance. Tourism is Del Norte County’s largest private sector employer and a critical component of the area’s economy. There is clear potential to significantly increase the number of overnight travelers and tourist spending by increasing the ease with which visitors receive information and orientation to the area’s diverse attractions and services. None of the current visitor information centers in the area are easily seen or located by travelers along the Highway 101 corridor. The conceptual design is for an IAVC of 13,000 to 15,000 square feet. It will include offices for the Chamber of Commerce, Redwood National and State Parks, and the Smith River National Recreation Area.